This month, I picked the “Vinyasa Vibes” outfit. FYI, the tops I got are size medium, and the bottoms are size large. The star of the show here is definitely the leggings. I wasn’t sure how they would look on me, but they’re so eye-catching that I had to try. I’m used to lace-up legging styles that start/end at the ankle, and being that I’m on the shorter side at 5′ 3″, that’s the part of leggings that usually gets scrunched up and doesn’t lay so glamorously. The cutouts on these black high-waisted leggings (which are 90% polyester, 10% spandex/elastane) fall a little higher up, and I think they look pretty cool. The design kind of wraps around my calves in a neat way. There’s a weird fraying section at the top of the design that I’m a little worried about, but otherwise, I think they look neat. The top edge of the high waist sort of nips in just a bit, so that they actually stay put on top of my hips. That’s much appreciated! This stretchy (98% nylon, 2% spandex) zip-up is dotted with holes to keep it from getting too stuffy after a sweaty class. It’s light and pretty warm for being so thin. I love a jacket with thumbholes, too. I feel like I’d sport this between my car and class, or throw it on before a jog on a chilly day. The fact that it’s so streamlined makes it feel just right for running/active outdoor workouts. As you can tell, this bra was a little tight on me. My back, in particular, is pretty broad, so I like when pieces have just a bit more give (or else just more coverage, so I don’t feel like I’m falling out of it). The interlaced details on the back are cool, though, and I do appreciate feeling like the bra isn’t going anywhere! I might save this bra for non-yoga workouts when I’m less concerned about comfortably twisting and moving around. Straps are super helpful when you’re feeling less than bendy. 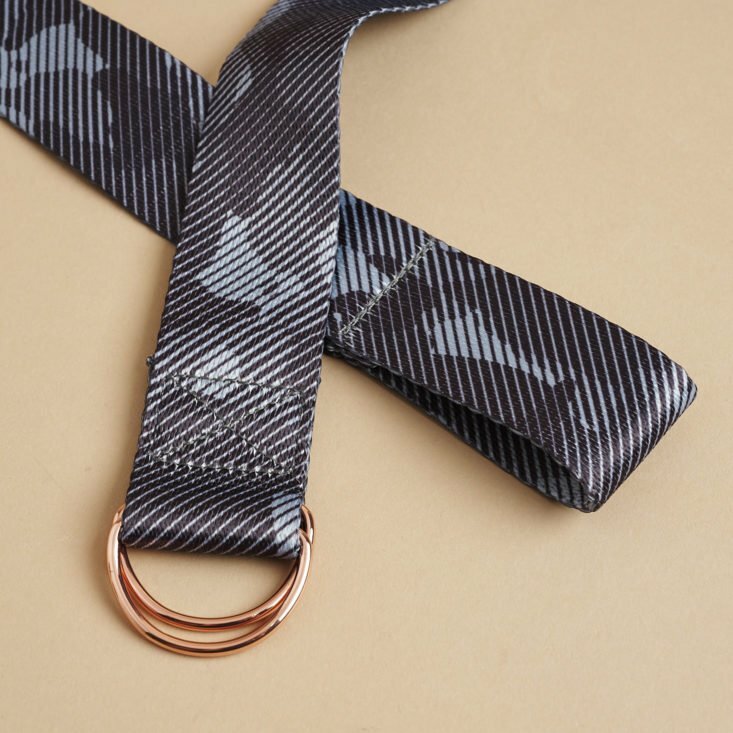 This one’s rose-gold hardware and gray camo-style pattern make it one of the chicest yoga straps I’ve seen from a subscription box. It’s smooth and soft, too. I love that jacket!! I am kind of interested in this sub but I’m not sure I need a new pair of leggings every month. Since I live in Tx, it’s too hot to wear leggings 8 months out of the year. I wish they offered shorts or skorts. I subscribe, but I skip more months than I keep. It is very easy to skip. I don’t want a new outfit every month, so unless I really love one of the 3 choices of outfits (and love all 3 pieces) I skip. I am usually a size small in stuff but sports bras a tricky. I am a 34D… their size guide only refers to band size, not cup size! Any thoughts on this? I LOVE that jacket- anyone want to sell/trade?? I almost grabbed this one this month – the leggings and top are really nice. But I wanted a more supportive bra with it, and they don’t mix/match. I love the vinyasa outfit. I always appreciate a jacket and I love the lazer cuts, my back gets really hot when I run while my arms and hands are colder, I never understood running vests, I need the opposite of a vest. And I have worn my gloves at work when my hands get cold. Ooo Amanda I TOTALLY feel you! My back is always sweating through my shirt when I run! Can anyone tell me how these fit compared to Reebok leggings?